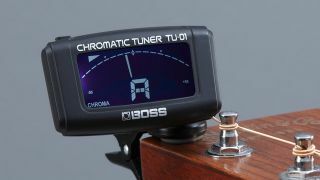 MUSIKMESSE 2016: In addition to its new TU-3W and TU-3S stompbox tuners, Boss has revealed two smaller, slightly retro-looking entries in its 2016 guitar tuner line-up: the TU-01 clip-on and TU-30 tuner/metronome. Taking on the likes of Korg and TC Electronic, Boss's TU-01 offers a bright display with digital meter and note indicator, plus two lights that indicate when you're in tune. Four modes are available - chromatic, guitar, bass and ukulele - while battery life is a solid 25 hours and there's an auto-off function to preserve power. Tuning accuracy is +/- 1 cent. The Boss TU-01 is available in May for £15. The TU-80 has been a go-to tool for musicians for decades, and the TU-30 brings its features to a more compact format. So, that means you get Boss's Accu-Pitch function, which sounds when you've reached the correct pitch; multiple tuning modes; rhythm patterns; reference pitch sounds and more. The unit runs on two AAA batteries, and features an instrument input, as well as a built-in mic for acoustic instruments. Boss's TU-30 is available in May for £22.99 street.